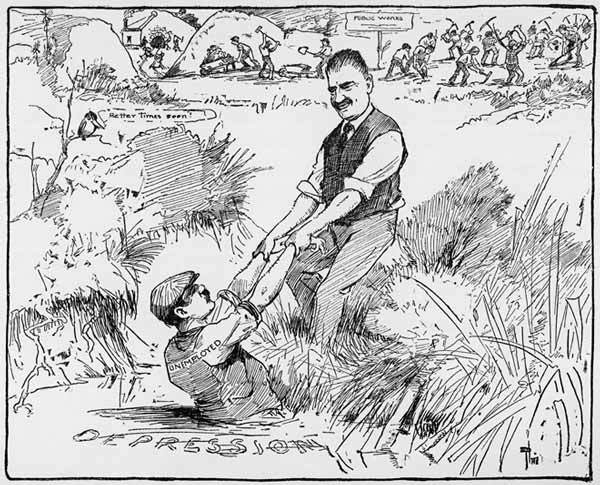 In this cartoon we see Prime Minister Gordon Coates pulling an unemployed man out of a swamp labelled ‘depression’. The image was published on 18 February 1928, though it is often said that the great depression began with the Wall Street stock market collapse in October 1929. The cartoon illustrates the fact that even before the market crash New Zealand was suffering economically, as it had through much of the 1920s.